Dickens' well-loved story The Christmas Carol has been in constant print since 1844. It has made into countless stage plays and movies and even cartoons. It has inspired people all over the world. It part of our culture. A celebration of Christmas isn't complete without it. Some might even suggest that Dickens is responsible for the way we celebrate Christmas today. That, in a sense, he invented what we know as Modern Christmas. But The Christmas Carol never should have been a world-wide sensation. It was never meant to change anything or anybody. It is a story that was written and published against all the odds, against all advice, against all reason. 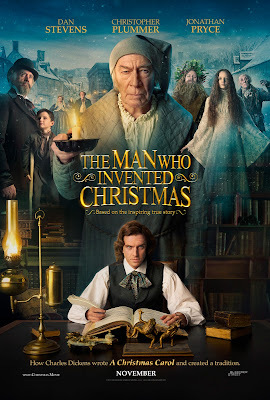 The "story behind the story" is being told in a new movie coming out in November called The Man Who Invented Christmas. The trailer intrigues me as it looks not just at Dickens and his most treasured story, but behind the scenes at the process of writing and creating a story. About how we find inspiration in real life and in our imagination. About how we find an ending... and a beginning.. and usually not in the obvious places. How titles can be elusive, and can make or break a project. How we create characters who then take on lives of their own, talk to us, ignore us, dislike us, elude us, and sometimes even refuse to do what we want. How not everyone will believe in us or in our story. Most of all, I hope this movie reminds me - and all of us - of the Power of Story. How every story deserves to be told, and told well. How, even when it doesn't make sense to anyone including us, telling the story might make a difference. And have an impact larger than we can imagine.